However, those models do not have customized electronic user interfaces such as those found in expensive, advanced prosthetics. Currently, a professor from Virginia Tech and his interdisciplinary group of undergraduate student researchers have achieved the integration of electronic sensors with customized 3D-printed prosthetics—an achievement that could someday result in more economical electric-powered prosthetics. This newly reported study out of the lab of Blake Johnson, a Virginia Tech assistant professor in industrial and systems engineering, went a step closer to optimizing the functionalities of 3D-printed customized wearable systems. The researchers can collect information regarding prosthetic function and comfort, for example, the pressure across the tissue of the wearer, by incorporating electronic sensors at the intersection between the wearer’s tissue and a prosthetic, thereby helping to enhance further iterations of these kinds of prosthetics. The incorporation of materials into form-fitting regions of 3D-printed prosthetics through a conformal 3D-printing method, rather than manual integration following printing, could also open the path for exclusive opportunities to match the hardness of the wearer’s tissue and including sensors at various locations across the form-fitting interface. In contrast to conventional 3D printing in which the material is deposited in a layer-by-layer fashion on a flat surface, conformal 3D printing enables the materials to be deposited on curved surfaces and objects. Yuxin Tong, a graduate student in industrial and systems engineering and first author of the published work, stated that the ultimate aim is to develop engineering practices and processes that can make it to as many people as possible, beginning with an attempt to help develop a prosthetic for one local teenager. Hopefully, every parent could follow the description from the paper we published and develop a low-cost personalized prosthetic hand for his or her child. Yuxin Tong, Graduate Student in Industrial and Systems Engineering, Virginia Tech. The researchers developed the prosthetics combined with electronic sensors by starting with 3D scanning data, which is analogous to capturing pictures at different angles to obtain the full form of an object—in this case, a mold of the limb of the teenager. 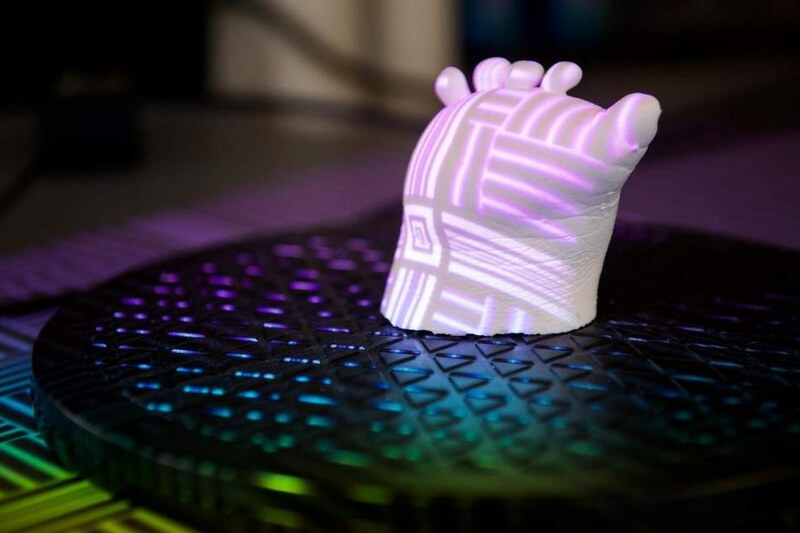 Then, they used a conformal 3D-printing method used to guide the integration of sensors into the prosthetic’s form-fitting cavity by using 3D scanning data. The process created by the researchers will lend itself to further applications in customized medicine and the development of wearable systems. Personalizing and modifying the properties and functionalities of wearable system interfaces using 3D scanning and 3D printing opens the door to the design and manufacture of new technologies for human assistance and health care as well as examining fundamental questions associated with the function and comfort of wearable systems. Blake Johnson, Assistant Professor in Industrial and Systems Engineering, Virginia Tech. Johnson got the inspiration to perform research on prosthetic hands when he came to know about his colleague’s daughter, Josie Fraticelli, then 12 years old, who was born with amniotic band syndrome. The development of her hand stopped while in utero. String-like amniotic bands hindered the flow of blood and affected the development of the right hand, resulting in a lack of formation beyond the knuckles. Johnson made use of his related research expertise in additive biomanufacturing and a group of interdisciplinary undergraduate researchers to 3D print the bionic hand for Fraticelli, which would later become the foundation for the now-published study. While working with Fraticelli, they continuously adjusted the prototype prosthetic by creating new additive manufacturing methods that would enable a better fit to Fraticelli’s palm, developing a more comfortable, form-fitting prosthetic device. They verified whether the customization of the prosthetic enhanced the contact between Fraticelli’s tissue and the prosthesis by as much as fourfold than non-personalized devices. This optimized contact area allowed them to indicate where to deploy sensing electrode arrays to test the pressure distribution, which enabled them to further enhance the design. Two customized prosthetics with and without sensing electrode arrays were used for performing sensing experiments. By carrying out these experiments with Fraticelli, they discovered that the pressure distribution when she relaxed her hand was different versus holding her hand in a flexed posture. The mismatch between the soft skin and the rigid interface is still a problem that will reduce the conformity. The sensing electrode arrays may open another new area to improve the prosthetics design from the perspective of distributing a better balance of pressure. On the whole, Fraticelli does feel that the innovative customized prosthetic enhances her comfort level. Her hand is soft and changeable under various postures and the prosthetic material is fixed and rigid; therefore, the level of conformity may continually undergo changes. Customized prosthetics still have scope for further enhancement, and Johnson’s group will continue to study and create innovative additive manufacturing methods to optimize wearable bionic devices.